What Special At PIKOM PC FAIR 2009 (II) ? PIKOM PC Fair 2009 (II) is around the corner. KL PWTC PC fair will start on tomorrow while Penang PISA PC fair start on next Friday. It is the 2nd PC Fair of the year 2009. For me, I more prefer to go PWTC PC fair because there has a lot of special offer that you can’t imagine. PC Fair is organized by PIKOM and it is Malaysia largest IT festival.So, what are you waiting for? Time to get some new gadget to arm yourself. Here are the PIKOM PC Fair 2009 (II) venue and date. As usual, it starts from 11:00 am to 09:00 pm. 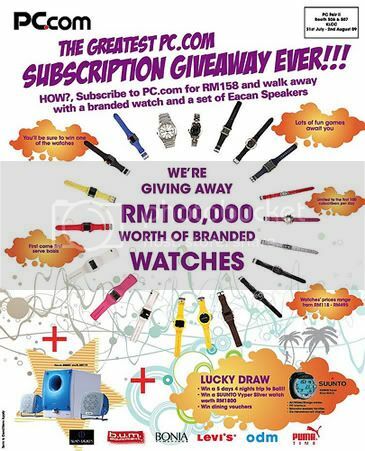 Just for your information, RM100,000 worth of branded watches will be given away! 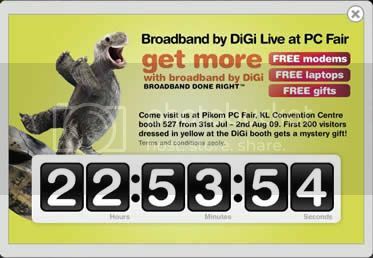 The another good offer is from DiGi. DiGi always come out something to combat with it’s big competitor Maxis in terms of their offers for this PC Fair. 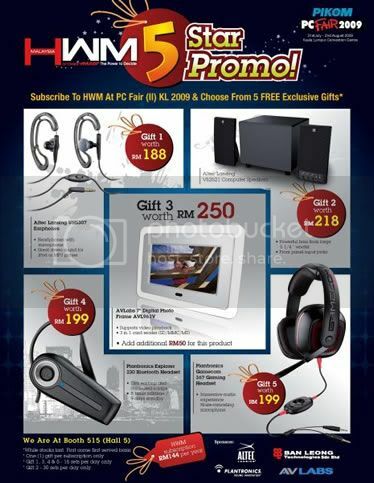 You can subscribe to HWM magazine and can choose 5 free exclusive gifts such as Altec Lansing earpiece, Altec Lansing Speaker, Digital Photo Frame, Bluetooth and headset. Altec Lansing speaker is limit to 30 sets per day while other is limit to 15 sets per day. Magazine subscription fees: RM144 per year. Worth to subscribe, right? This entry was posted on Thursday, July 30th, 2009 at 11:24 pm	and is filed under Finding For Free, Penang Event. You can follow any responses to this entry through the RSS 2.0 feed. You can leave a response, or trackback from your own site. i wan know when is the pc fair aug 2009 at pwtc? the list no write out? its ok,i already find out the answer today. pc fair not coming kuching? or didnt write out?